I took Namine and her cousin to the zoo in Madison before we went back home. I gave the girls a choice: since we had the afternoon to ourselves, we could go back to the children’s museum or we could go to the zoo. Since we had already been through most, if not all, of the museum, the girls decided on the zoo instead. The Madison zoo, actually one Henry Villas Zoo by name, has no admission fee. Instead, there is a “recommended donation” of $2.00 per person, but nothing mandatory. I don’t know how large it is in square feet, but it reminded me a lot of the Atlanta zoo; there were a lot of hills (nothing too insurmountable for a child in a wheelchair, though), and plenty of twists and turns in the sidewalks. The girls and I spent more than four hours exploring the zoo. In that time, we saw giraffes, rhinoceros, bears, seals, tortoises, an indoor rain forest, and even more. We didn’t even get to see everything! We managed to see inside the primate house, but we never made it to see the reptile or small mammal houses. We did see a lot of small mammals outside, including badgers (both were sleepy) and ground hogs (definitely not sleepy). Still, for the time we had, we definitely had a good one. Butterflies weren’t part of the zoo’s attractions, but we saw some beautiful ones anyway. Namine and her cousin noticed a great many of caterpillars congregating on the leaves where the butterflies kept landing, too. After the girls decided they were too tired to explore any more, we stopped at the train for a ride around the zoo. 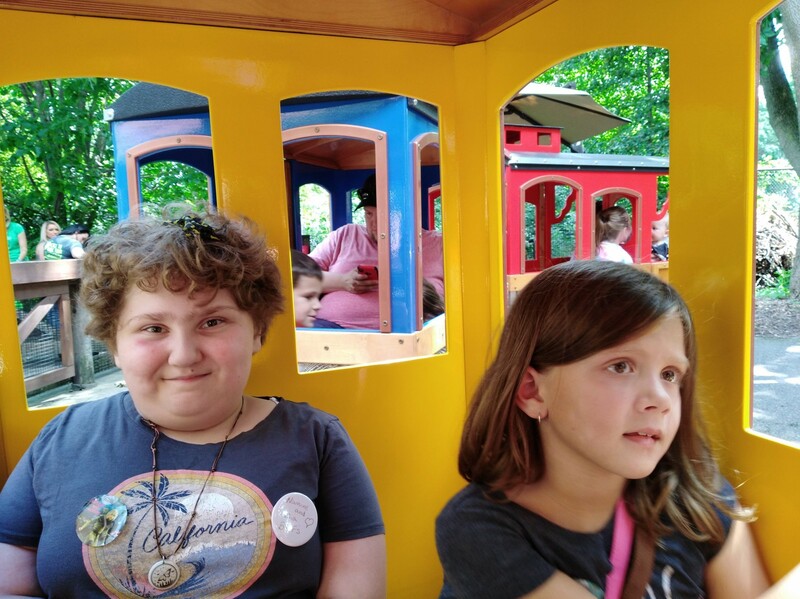 When Namine rides the train at the Milwaukee Zoo, she needs help transferring from her wheelchair to the train car. I expected to have to do the same here, but one of the staff informed me that they had a ramp. When we were all done — both girls were quite tuckered — we stopped in the cafe for a treat. 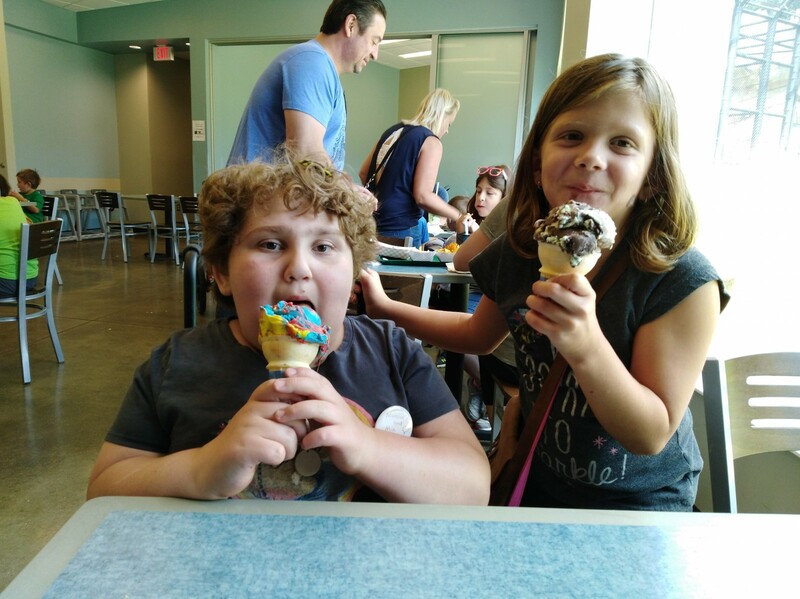 Namine got a dish of Superman ice cream, and her cousin opted for chocolate mint.